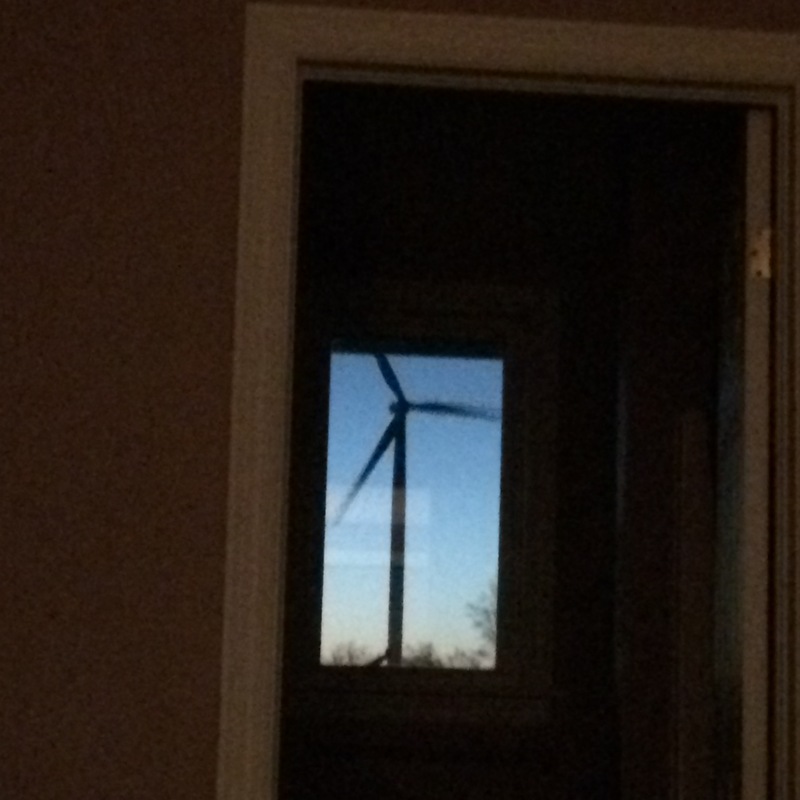 Last week, the wind power communications machinery was touting the virtues of the Gunn’s Hill wind power project which they claim is Ontario’s first real “community” wind power project, half-owned by the local community. The project’s success was owed to its partners, the Oxford Community Energy Cooperative, a (non-local) First Nation, and Bullfrog Power as well as the Germany-based power developer, Prowind. The story was repeated on CBC’s Ontario Morning. Retired engineer William Palmer wrote to correct the CBC on their assumptions, with this letter. I listened with interest this morning as Wei Chen spoke with Miranda Fuller, Communications Director of the Gunn’s Hill Wind Project about this “community project” of the Oxford Community Energy Cooperative. We heard also learned of the other owners, ProWind Canada, and Six Nations of the Grand River Development Corporation. Let’s look a little deeper at this community involvement. The Cooperative Web Site says, “The present membership consists of 160 individuals and organizations that live in the project vicinity, Oxford County and all of Southern Ontario,” to whom $9 million in shares and debentures were sold. Yet, to be a member of the cooperative the minimum share is $100, so not every member needs to be a major investor. It is interesting to read who some of the other members of the cooperative are – including the project developers. Elsewhere the website says there are 186 members. So that means there are about 33% of 186 = 62 members of the cooperative that live in Oxford County … which Wikipedia tells us had some 105,719 residents in 2011, so we can see that 0.06% of the county population are supporters. It’s not exactly a wide support base in the county. You might be interested in knowing that at the Environmental Review Tribunal the Township of Norwich Councillor for the impacted ward, Mr. Wayne Buchanan spoke of the Township of Norwich’s past and ongoing objections to the Project. He presented three letters to the Tribunal, one from the Township to Premier McGuinty asking for a moratorium on wind turbine developments, one to the Approval Holder (developer) asking for a delay in the development until noise and health studies are available, and one to Premier Wynne noting that the Township of Norwich was an unwilling host of industrial wind turbines. You might also be interested in knowing that the office of the participating Six Nations of the Grand River Development Agency is located over 50 km from the wind turbines. It is a financial investment, but not exactly in their neighbourhood. (A similar case occurred in the community of Dutton Dunwich, where the participation of First Nations groups included First Nations located near the Manitoba Border or James Bay, but not the local First Nation.) “Points” are received by the Ontario Renewable Energy Approvals process for “community involvement, or for First Nations involvement, even if they are not from the impacted community. Now, why would folks invest in such a development? Well, the 10 turbines of Gunn’s Hill will be paid some (10 x $135 a MWh x 1.8 MW x 8760 hours a year x 24% capacity factor) = $5,108,832 a year for the estimated 37,843 MWh they will produce – whether the electricity they produce is needed or not (as wind developers can be paid to curtail operation or not produce when the electricity is not needed). Interestingly, had the power been produced instead by Bruce Power, the payment would have been less than half as much. That $5 million a year for a 20 year contract, is pretty good return for a project with a total investment of perhaps $40 million. Few other (government supported) investments will return some 12.5% a year on a guaranteed basis for 20 years. Sadly, the power consumers of Ontario, including those who cannot afford to pay their electricity bills, are the payees of that investment return. Wei Chen started to ask a question that deserved an answer … about how people will think when their electricity bills arrive. Ontario simply cannot keep paying twice as much for a product that is delivered best at times when it is not needed … and then pay Michigan or New York State to take the excess off our hands (or at the very least give them the electricity for free to power their industries) without adversely impacting power rates in Ontario. It is no wonder that Ontario rates are climbing so rapidly. I thought that Wei Chen or other Ontario Morning staff might be interested in scanning what concerns I would have presented to the Environmental Review Tribunal where I was accepted as an expert witness, had they chosen to accept all my testimony. (They did not, and what was presented was only a fraction of what was initially prepared for them). A copy of my presentation as initially offered to the Environmental Review Tribunal is attached, and signed as a Professional Engineer. I note that many others in the community also made presentations – again with only partial acceptance by the Environmental Review Tribunal. One of the Gunn’s Hill wind turbines. Photo taken from a non-participating, non-consenting and not happy neighbour’s home. Way to go Bill Palmer! Amazing analysis! Thanks for the gross proceeds but the net proceeds are unknown. How much will maintenance, repairs, and insurance cost? A single blade replacement costs ~ USD $100,000 and about 1/4 of insurance claims are for blade damage. It’s a good bet that these IWTs won’t last for 20 years. Saw a comment about how much it costs to remove a turbine at this time. Maybe I can find the cost estimate. Decommissioning cost est. ~ USD $66,700 per turbine as of Feb.2017. What more will it take for the portion of people in Ontario who still don’t realize that these turbines emits noise, low frequency noise modulations and infrasound radiation to realize the potential for harm. The list of symptoms that this causes nearby residents is on the Waubra Foundation website for all to see. And yes, it’s frightening to look at that list and to think it could happen to you or your family, but everyone needs to look at it so they understand what has already happened and is already happening to innocent rural residents in Ontario. CBC is not a source of the truth. However, Dr. King did not testify. Is there a direct link to these court documents? CBC has provided some public information. Re: Justice Mary Sanderson’s decision/ruling, c.July 18, 2012. Are all of the rulings pertaining to Justice Sanderson’s decision filed under this Case number? That’s why they should not install wind farm on residential area. Althought. it’s environmental friendly, is it also a human friendly? Follow the links to the Ontario records and data recently released. Hi, trying again, hopefully the right place. Thank you, Mr. Palmer for your rational and realistic words so much needed in this world of wind mills lies and desperate, false propaganda like the CBC show – for the supposedly innumerate Ontarians. Your 0.06 % shows the magnitude of their deception tactics. What angers me most that Mr Mc Guinty and Miss Wynne listened only to this kind of deceptive propaganda and refused to listen to professional power engineers like myself and even to PEO recommendations. You can find a detailed, easily to understand letters- engineering evaluations- I wrote to Ms Wynne without receiving a reply. Her energy ministers also have no technical education and background so they can be easily manipulated. 40 billion damaqe to the Ontario economy caused by their collective stupidity, and naïve, irresponsible behaviour – it is hi time to impeach Ms Wynne..
My articles , published, you can find on the internet : “Open letter to premier Kathleen Wynne” and , after the moratorium on wind mills “Wind, solar do not deserve a second chance” by Maks Zupan, P. Eng. I am a professional electrical power engineer, retired, worked on power plants, nuclear power plants, transformers ,and transmission and grid planning. Have not forgotten grade 4 mathematics yet…all that is needed to understand the green energy deception and fiasco. Hey there Winds got to go… thanks for your support… your right about strength in numbers … not just here in DD but all across this beautiful province of Ontario… these wind companies don’t care about the damaging effects of living in close proximity to IWTs….or the economic hardship they are causing…… they will continue with this project here in DD and Amherst Island and the others….. suspension of future projects are not cancellations of future projects..
Our councillors that went to Toronto to meet with Energy Minister Glenn Thibeau…. they were really concerned that we were concerned that they were concerned about us being so concerned!!! Another meeting was promised with the energy minister Glenn Thibeau when he was in the London area…. which has been this week….. no contact by the Glenn at all yet…. probly forgot!!!! He has a lot of important things to do…. like staged meetings with soft pre-approved questions only!!! So…. now that we have done our due diligence in voicing our rights as citizens to our government…. Had a democratic public municipal referendum with 84% .opposition to this project….. Went to the Minister of Energy and personally said NO THANKS…. Inveridiots have scheduled their public meeting for March here to inform us how we are going to do this project against our will…..
All residents of Ontario need to gather at Amherst Island and block off that project right at the ferry docks.. all Ontarions need to physically lock arms with your neighbours and fight this BS right at the point of contact…. pick a dock… pick a road… pick a street and physically blockade these projects with cars …trucks… farm equipment… boats… bikes. .. hay bales…. tires… anything you can drag there to blockade….. they can not arrest all of us although I’m sure premier wynne will try cause that’s what dictatorships do to bad actors!!! Personally I’m so surprised that Richard … Barbara…. Parker… Sommer….et al…. haven’t been detained and or “disappeared” yet for opposing so strongly to the projects and informing the general public of what is really happening…..
We will fight you from the back roads…. We will fight you from ditches…. We will fight you from our Woodlots.. This will be my last post on this site as the time has come for the redoubt to begin……. There were also those who said give OFA and Wynne a chance a few years back. Others believed the wolf is not at my door. DD, don’t give up posting! I’m with you Notinduttondunwich. As I stood alone in protest at the University of Western Ontario on a cold night in January waiting for the arrival of Justin Trudeau; again I felt much disappointment with the complacent demeanour exhibited by the people of Ontario. I asked for support at Queen’s Park last year; again..nothing. I am very grateful for the tremendous support of a handful of warriors on this site (you know who you are), who continue to work so diligently in their effort to stop this insanity. I as well, fear for their safety. You are right, strength is in numbers. For one to physically stand with you is the least one can do to protect themselves. Ignorance will not make this go away; such a tragedy. “In the end, all one has is their beliefs and values”, again, you are right. If I can help, please get my email address from the WCO president. She has my permission to give this to you. Thanks Bill for all your work and follow up. As for the total investment, the developer took out a loan for $75 million, and all leaseholders for the project have a $75M “charge of lease” on their land titles.